New Delhi: India’s solar power tariffs fell to a new low of Rs2.62 per unit during the auction of a 250 megawatt (MW) capacity plant at Bhadla in Rajasthan. South Africa’s Phelan Energy Group and Avaada Power bid Rs2.62 per kilowatt-hour (kWh) to win contracts to build capacities of 50MW and 100MW, respectively, at Adani Renewable Energy Park Rajasthan Ltd. SBG Cleantech bid Rs2.63 per kWh to construct a 100MW capacity, said a person associated with the auction process, requesting anonymity. This price is lower than the average rate of power generated by the coal-fuelled projects of India’s largest power generation utility, NTPC Ltd, at Rs3.20 per unit. “Another milestone towards PM @narendramodi’s vision of clean affordable power for all: Bhadla Solar Park achieves tariff of Rs2.62/unit," Piyush Goyal, India’s minister for new and renewable energy, power, mines and coal, said in a tweet. India’s solar power generation capacity has increased by a third to 10,000 MW from 2,650MW as of 26 May 2014. SBG Cleantech is a joint venture between Japan’s SoftBank Group Corp., India’s Bharti Enterprises Ltd and Taiwan-based Foxconn Technology Group. The venture was set up in June 2015 after SoftBank Corp.’s Masayoshi Son pledged to invest at least $20 billion in solar energy projects in India. Avaada Power is promoted by Vineet Mittal and is his second innings in India’s clean energy space after Tata Power Co. Ltd bought the entire 1.1 gigawatt (GW) renewable energy portfolio of Welspun Energy Ltd for $1.4 billion last year. A total of 27 bids aggregating 3,250MW were received for the 250 MW capacity on offer. 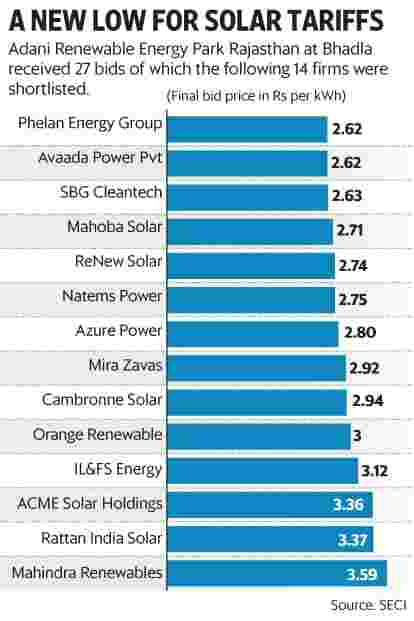 State-run Solar Energy Corp. of India (SECI), which is also running the bid process for another 500MW of solar power capacity at Bhadla, had set the reserve price at Rs3.01 a unit before the reverse auction began on Tuesday afternoon. The auction for this 500MW capacity being developed by Saurya Urja Co. of Rajasthan Ltd on 11 May is now eagerly awaited, with experts being of the opinion that the tariffs may fall further. Rajasthan Renewable Energy Corp. Ltd is a joint venture partner in both parks. Anish De, partner, infrastructure and government practice, at consulting firm KPMG in India, said that the Bhadla tariffs change the equation for every form of electricity generation in the country. “It has beaten all expectations. The industry was expecting the tariff to fall to Rs2.8 per unit. At these prices, it is a matter of time before solar along with storage transforms India’s energy landscape," said De. However, some analysts have expressed concerns about the sustainability of such low tariffs. Consulting firm Bridge to India in March termed the recent low winning bids for solar power projects in India “unsustainable" and warned that “inadequate risk pricing poses a severe viability challenge for the sector". The solar space has already seen a significant decline in tariffs from Rs10.95-12.76 per kWh in 2010-11. The previous low was Rs3.15 per kWh, bid by France’s Solairedirect SA in an auction last month to set up 250MW of capacity at Kadapa in Andhra Pradesh. This low was preceded by Rs3.30 per unit quoted for a 750MW project at Rewa in Madhya Pradesh. SECI has attributed the bidders’ interest to tripartite agreements (TPAs) between the Reserve Bank of India, the Union government and the state governments, which provides comfort to power producers against payment defaults by state electricity boards (SEBs). India’s growing green economy has been fuelled by the government’s ambition around clean energy. India plans to generate 175 gigawatts (GW) of renewable energy by 2022. Of this, 100GW is to come from solar power projects. With 8.8GW of capacity addition projected for the year ahead, India is set to become the third-biggest solar market globally in 2017, overtaking Japan, according to the India Solar Handbook 2017 released by Bridge to India on Monday.